SOLD OUT! Please visit the link below to get on a list for early notification of the next one. Thanks for checking this event out, I appreciate it, and I'm sorry it went so quickly. http://bit.ly/sethwaiting (there may be one slot opening up for this one, first come first served). For the first time in two years, I'm hosting a group session in my office in Hastings on Hudson, NY (about 40 minutes by train from midtown Manhattan). We sit around a big table in my office for the day. No slideshows or presentations, just an intense workshop designed to cover your questions, your problems and your stuckness. The session is off-the-record, and attendees bring their big issues. We can talk about your mission, your website strategy, whether your business model needs an overhaul or how to more effectively tell a story about what you do and why people should engage with your organization. Past attendees have started successful companies, sold them, launched remarkable marketing campaigns and walked away with more energy and optimism than they came with. I don't do any consulting or coaching, so this is the closest you can get to a 1:1 session. More important, I believe it's more effective than coaching would be, because hearing what your peers are wrestling with is often more useful than your own questions--it's the stuff you didn't even realize you ought to focus on that can make a huge difference. Due to the small size of this event (14 people), expect that it will sell out quickly. Alas, no student or non-profit discounts for this one. 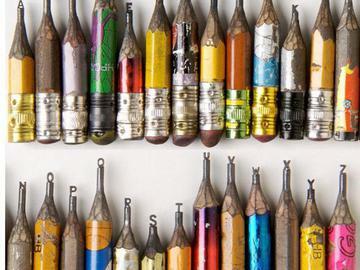 Art: Dalton Ghetti, who, with astonishing care and love, carves the pencils by hand.